A cautionary tale of greed and selfishness, and their opposites in generosity and humility. Such a perfect story to read in the lead up to Christmas when it is easy to lose sight of kindness and love for all those around us in the crush and rush of holiday preparations. Just as Scrooge tramples on the lives of his staff and family in his quest for financial gain so too do we sometimes neglect the feelings of those around us in pursuit of material objects. The story is a simple one on the surface, Ebenezer Scrooge, owner of a large company is well known as a miser. Never giving a cent more than is due and working his staff hard. He has pushed away his only family, a nephew who remains open to reconciliation if only Scrooge would reach out. 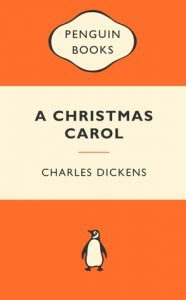 On Christmas Eve Scrooge is visited first by the ghost of his late business partner who warns him that an unhappy limbo awaits if he does not improve his behaviour towards others in his lifetime. Then, as the famous plot goes, Scrooge is visited in turn by the ghosts of Christmas past, present and future. Each ghost shows him a scene and imparts a lesson, opening Scrooge’s eyes to the world he has been blind to. Though the moral of the story is heavy handed I think it serves its purpose well. It fits nicely with Dickens other writings on caring for children and the poor, and I think there are few in the world who could do without a reminder to care for others, regardless of their station in life. It’s only a short tale, but I think it is one that I will enjoy reading when Christmas time comes around again. *Note* I listened to Neil Gaiman’s live recording at the New York Public library in which he read from Dickens’ own annotated copy of the story. As such there maybe be some variation between the version I listened to and the edition on print.